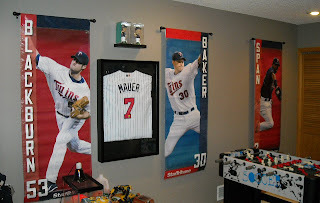 Back in November (see my post here), we stopped by the Twins Pro Shop in Roseville and were disappointed in the high prices of game used bats and Metrodome Banners. My sons and I stopped by again over the weekend to find that they had cut their prices significantly. They had a game used David Ortiz bat that was used in April 2009 when the Red Sox visited the Twins. When we first saw it, they were asking $400. Ouch. They had marked it down to $100, so my younger son snatched it up. I also picked up a game used bat belonging to Drew Butera. 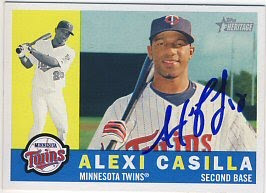 He's probably the Twins third string catcher now behind Mauer and Morales. At only $25, I couldn't resist. 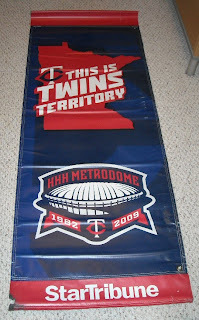 I also couldn't resist picking up a few of the 2009 Metrodome banners. They were half of what they were asking back in November. I picked up Blackburn, Baker, Span and Buscher. Even though Buscher isn't on the team anymore, I picked it up because it was only $25, and the back of these banners have a nice "Twins Territory" logo with the same Metrodome logo that they had on the baseballs used there last year. The colors on these banners are a bit different than the 2008 banners so they don't look great next to each other, but I'll probably swap them around depending on who's playing best during the year. I needed to replenish some of my supplies after TwinsFest. There aren't many places near me that I can buy things like ball cubes, card holders, and 9-pocket pages, especially at reasonable prices. And shipping is too expensive to buy small quantities online, so I buy in bulk. 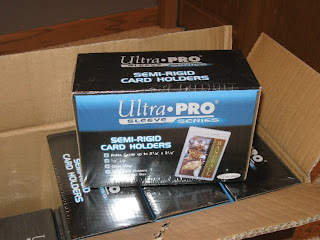 I bought a case (10 boxes of 200 each) of Ultra Pro semi-rigid card holders, which is what I store each of my autographed cards in. I ordered these from a seller on Amazon.com, and only had to pay $6.49 shipping for the whole case. Most sellers on eBay are charging about $10 just to ship a single box of 200 holders, on top of $9-$15 for the holders themselves. I paid $11.50 per box, shipped. These holders will last me several years. 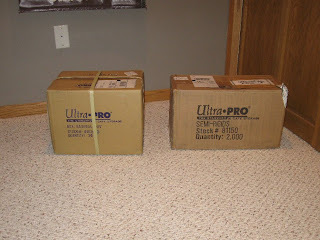 I also bought a case of Ultra Pro UV protected ball cubes from a seller on eBay. 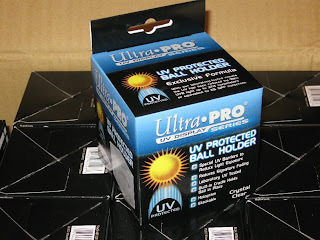 Ultra Pro also sells non-UV protected cubes, but I have decided that the extra protection is worth the extra dollar or so. A case has 36 ball cubes in it. I paid less than $2 per cube by buying the case. 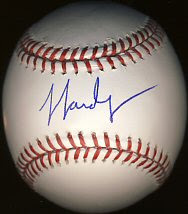 I also ordered another dozen Rawlings Official Major League baseballs from autographsupplies.com. This was my first order with them and I was happy with it. I paid just over $10 per ball for a dozen. Some collectors use other, less expensive baseballs, but I prefer to only use Rawlings Official Major League Baseballs (romlb). 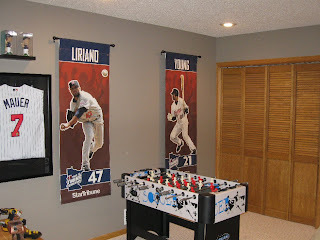 I made a slight change to the basement in light of the current Twins roster. 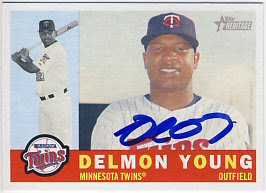 I took down the the Mike Redmond Metrodome Banner and replaced it with the Delmon Young banner I had bought earlier. Redmond is with the Indians now, so I thought I'd make sure the wall reflects the current roster. 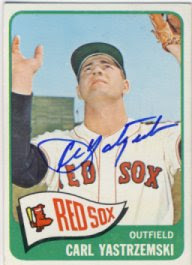 Yesterday I finally got done creating my page of my signed 1965 Topps cards. 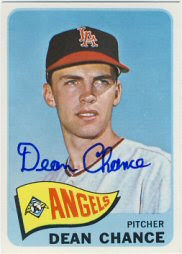 It's similar to my page of my 1958 set, and helps me keep track of those cards I have and still need. It's terribly tedious to create, but hopefully it's accurate. 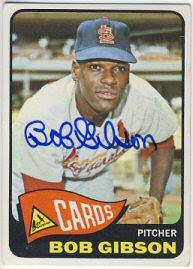 Some of my favorites include: Carl Yastrzemski, Tony Kubek, Dean Chance, Hank Aaron, Bob Gibson and Ernie Banks. 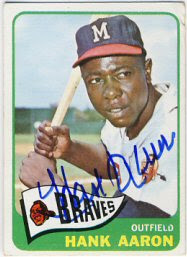 I have 340 cards signed out of the 598 card set. I'll never complete it, but I'm hoping to get 450. Sunday's main goal was to get Jason Kubel on the game used bat I had bought. After taking Johnny to a couple of the shorter lines during the first shift, we joined my wife and younger son in line, even though there was nearly 3 hours before that shift started. 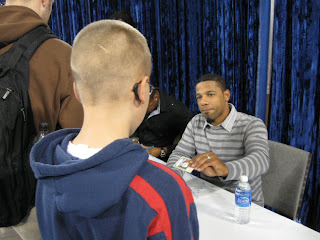 During this time, my younger son went and played a few games, and my older son walked around the card show a bit. Before the first shift ended, Johnny ran to another line for me. 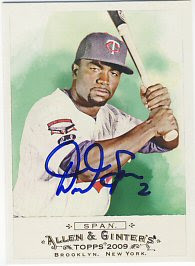 He got Denard Span on a 2009 Allen & Ginter, and got Jerry White and Scott Ulger on my team ball. While waiting for Kubel, Young and Hardy, I decided to run through the second shift line which was Kevin Slowey, Alexi Casilla and Francisco Liriano. 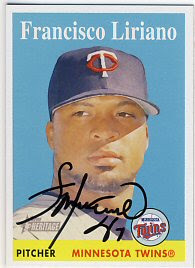 I had Slowey and Casilla sign their 2009 Topps Heritage, and Liriano signed a 2007 Topps Heritage. Then we got back in line and waited, a long time, for Kuble, Young and Hardy. My wife was along, so I got two autographs of each of them. 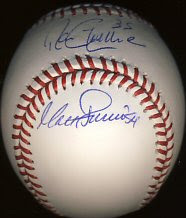 I had Kubel sign the ticket stub from his April 2009 game in which he hit for the cycle. 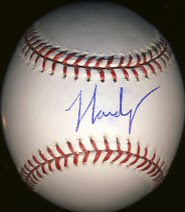 And I had J.J. Hardy sign another ball for me since the one I had got on Friday night was smudged. 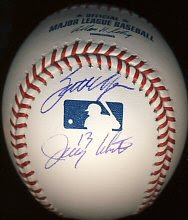 My wife had Kubel sign my game used bat, Young a 2009 Topps Heritage, and J.J. Hardy, a 2009 Allen & Ginter. We were some of the first to get through the Kubel line, so we had time to also go through another one during that session. 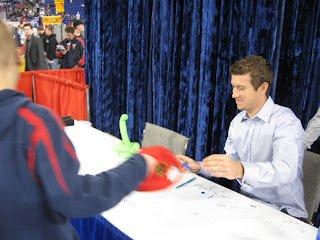 I went through Blyleven's line to get a ball signed for a friend, and Johnny ran to the Joe Nathan/Carl Pavano line. 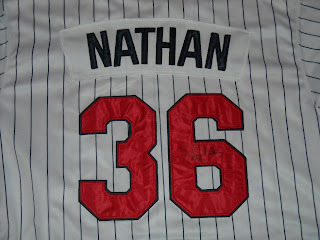 He got Nathan to sign a 2005 All Star Game ball for me (and got Pavano on his hat). Johnny and I spent the last session looking around the card show. 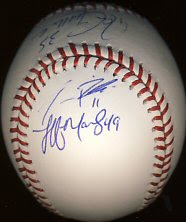 David and my wife went through one last line, and my wife got Pat Neshek on a picture for me, and Jeff Manship on my team ball. 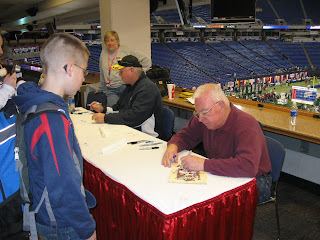 That wraps up our TwinsFest autographs for 2010. Things will really slow down for me now. 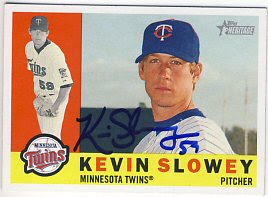 I haven't sent out any ttm requests. 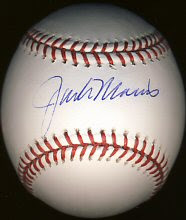 I have a few paid signings that I've sent to, including Morneau. 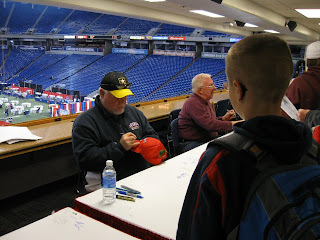 On Saturday of TwinsFest, just my older son and I braved the crowds and I targeted mostly the retired players. 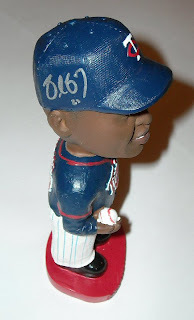 There was no one on the first shift I was interested in getting, so I got in line for Rod Carew. John had run to a couple different lines during this wait, which I detailed in my posts about his items. 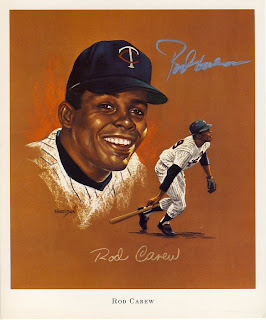 John and I both got Carew to sign a 1970 John Wheeldon print that was a Super Valu giveaway. 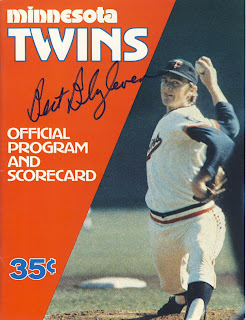 Next, we headed over to the Blyleven/Jim Perry line which turned out to be just Blyleven. 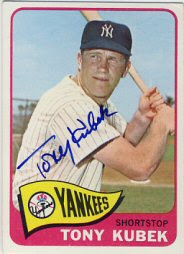 I had him sign a program from 1973. 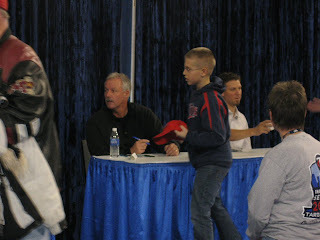 After Blyleven, I got in line for Molitor, even though he wasn't signing for another three hours or so. 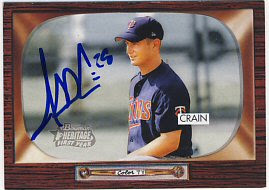 I wanted to be sure to get Molitor, as this was the only time he was signing this year. 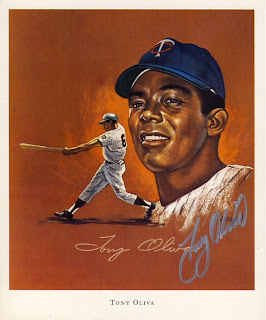 During this time, John got Tony Oliva and Jack Morris for me (as well as himself). He got Oliva to sign a Wheeldon print, and Morris signed a ball. 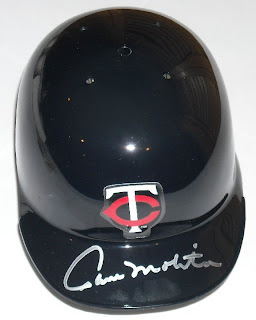 We got through Molitor's line quickly, and we each got a mini helmet signed. 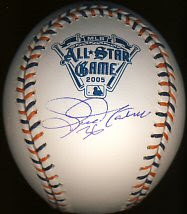 Finally, we had time to get through Joe Nathan's line, where we each got a 2009 All Star game ball signed. 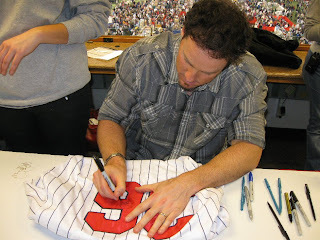 Tomorrow I'll post my remaining TwinsFest items. 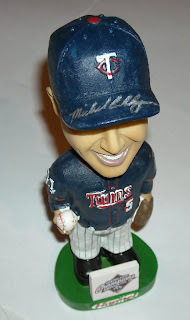 I finally got all of my TwinsFest items scanned and photographed. My wife attended Friday night and Sunday. Since she has no interest in autographs, she gets autographs for me. I organize a binder and backpack for her, and put items in there to get signed by whatever players are at the lines she is going through with one of our sons. Since she attended Friday night with us, I got double the autographs. 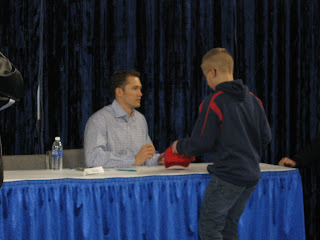 Unfortunately, since she waited in the Morneau line with my older son, she didn't get many for me that night. My younger son and I didn't waste any time. We went right to a line with Guerrier, Baker and Crain. I got Guerrier on my team ball, Baker on a 2009 Topps Heritage, and Crain on a 2004 Bowman Heritage. 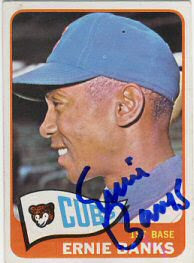 After that, we got in the line for Mijares, Blackburn and Hardy. 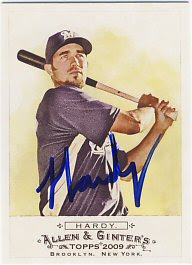 As I mentioned before, Hardy was the only one that was there. 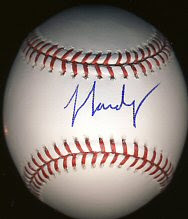 I had him sign a ball, which got a little smudged. After Hardy, We went to see Ron Gardenhire and Joe Nathan. 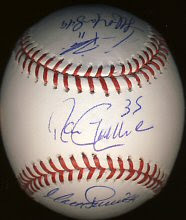 I had Ron Gardenhire sign my team ball and Joe Nathan sign a jersey. My photos of jersey's never turn out well. It actually looks much nicer than it looks in the picture. 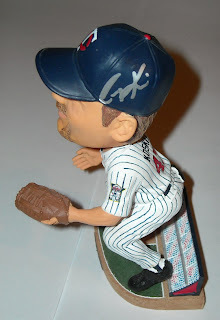 Finally, we went to a line with Michael Cuddyer and Jon Rauch. I had bought a game used Cuddyer bat on eBay. 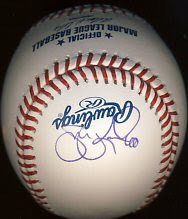 I have no proof that it was actually used by Cuddyer, but it's his model and engraved, which is what I was really after. He took the time to switch to a gold pen, which I didn't even consider, to match the engraving and signed it very nicely. This might be my favorite item from the whole weekend. 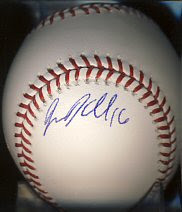 Jon Rauch signed my team ball. 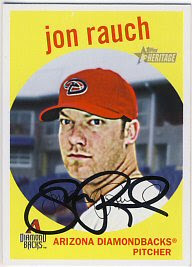 My wife and son also went through the Cuddyer and Rauch line, so my wife had Cuddyer sign a bobblehead for me, and had Jon Rauch sign a 2008 Topps Heritage. Friday seemed pretty busy and we just had time to get through one line per session. Probably because we didn't split up. 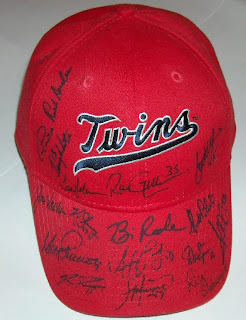 John started Sunday by getting Ron Gardenhire on his cap and Tom Kelly on his 1987 World Series Program. We really didn't want to miss the line in the third session with Kubel, Young and Hardy, so we got in that line almost right away. 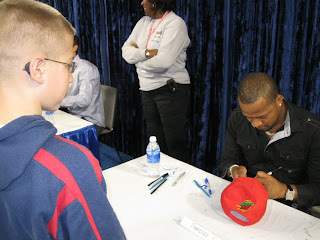 While we sat in that line, John ran over and got Denard Span, Jerry White and Scott Ulger on his Twins cap. 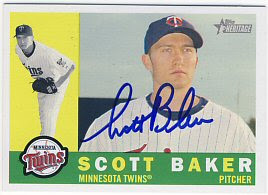 He also added to that cap in another line with Scott Baker, Matt Guerrier and Rick Anderson. 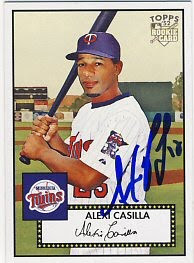 Next, the signings in the second session started, so he got Slowey and Liriano on his cap, and Casilla on a 2007 Topps '52 card. 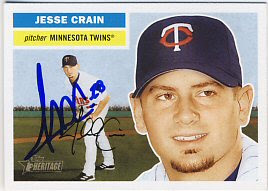 He got in another second-session line where he got Jesse Crain on a 2005 Topps Heritage, Tom Johnson on his cap, and Corey Koskie on a bobblehead. Finally, we got through the line with Hardy, Young and Kubel. 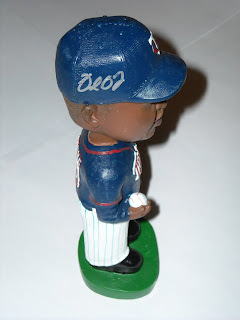 He got Hardy on a ball, Kubel on a ball (which he signed on the side panel), and Young on a bobblehead. There was one last session, but not one that Johnny wanted to go through, so we looked around the card show a bit, and he bought a Harmon Killebrew stadium giveaway bronze statue. I haven't even started scanning in my items, but I hope to get it all done over the long weekend coming up. I've also depleted my supply of baseballs and ball cubes, as well as Ultra Pro semi rigid card holders, so I'll have to look for deals to replenish those.